The second season seems likely to avoid the blockbuster drama and police-procedural formulas of other Sherlock interpretations while taking its own creative liberties. Out of the many anxiety-inducing mysteries Elementary has presented its viewers, the biggest is this: Will it be good in its second season as it was in its first? After premiering last fall and taking a few episodes to really establish its characters and tone, the CBS Sherlock Holmes adaptation began delivering exciting stories each week while offering some of the strongest character development and episodes-spanning narratives arcs on television. It all built to a satisfying season finale. Thankfully, with tonight's premiere, “Step Nine,” Elementary seems destined for a strong sophomore season. “Step Nine” accomplishes two major tasks: reintroducing the show's leads and working in elements of Holmesian canon the show had avoided. 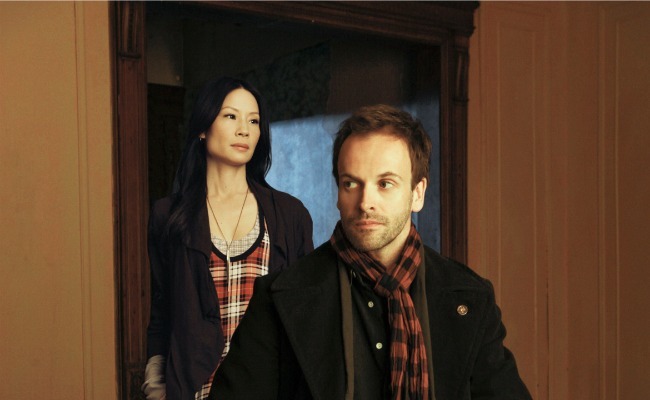 Sherlock Holmes (Jonny Lee Miller) and Joan Watson (Lucy Liu) find themselves on a trip to London to help Holmes's Scotland Yard contact Lestrade (Sean Pertwee) on a reputation-damaging case. But for Sir Arthur Conan Doyle fans, the nicest touch is the introduction of Holmes's smarter, lazier (in Homes's words) brother, Mycroft. The episode could have collapsed under the weight of the case, the new characters, and the basic task of catching viewers up to the show's dynamic. But it doesn't. “Step Nine,” as with Elementary as a whole, succeeds because it avoids the methods and tropes of both other Holmes adaptations and police procedurals. For much of the last century Sherlock Holmes has been given short adaptations—a few miniseries, one-off movies, and so on. Most of the productions have favored creating dense stories packed with references to Doyle mythology and pop-culture mystery clichés, with a distinctly un-Holmseian level of drama. Even some of the best adaptations have gone this route. Even Guy Ritchie's pair of Holmes films starring Robert Downey Jr., the most true-to-the-books adaptations yet, put Holmes and Watson on high-stakes cases rather than tasking them with more minor crimes. And the BBC's Sherlock exaggerates some canon elements, making almost every one of its so-far six episodes a matter of national security with grandiose consequences. These are fun and well-done, but they aren't true to Doyle's style. Instead of slow-burn thrillers, they're more akin to fast-moving blockbusters. The original Doyle stories were the procedurals—the Law & Orders and CSIs—of their time. They were short installments, each with their own distinct mystery or adventure. But, unlike the glut of crime procedurals of modern television, they did not rely on formula. Almost every procedural these days has a set style and structure. The cases are generic, the characters are archetypes that quickly turn into parodies of themselves, and the charm dependent largely on a gimmick. Thankfully, Elementary, like its source material, is different. The cases provide catalysts for revelations about the characters and larger themes, as with the blackmailer in the first season who revealed Holmes’s hatred of manipulation, or in “Step Nine,” when Holmes must confront the narcissistic way he treated Scotland Yard before his drug habit spiraled out of control. The cases form the backbone of each episode, but they are not separate from any real drama or character development. At times, though, the format has flaws. The 20-plus episode nature of an American television season means storylines have to be stretched out and episodes padded. Elementary's first season faltered from that. But the long nature of the seasons allows for character interactions to be more subtly developed, and payoffs feel more rewarding. In addition to providing a great set of stories of Sherlock Holmes solving crimes, Elementary has a wonderfully mature approach to handling serious issues such as addiction and depression. Holmes in this show is a recovering drug addict with Watson as his sober companion, and his struggles have often served as the base for much of the program's great drama and heartwarming moments. The theme of addiction is still prevalent in the Season Two premiere, but it's approached differently. Gareth Lestrade, the “best of a bad bunch” as Holmes calls him, is an addict—an addict for the fame that came from working with Holmes and solving high-profile cases. Watching Miller and Pertwee together is fascinating—not just because it's the madcap Great Detective and a British copper in the tradition of Life on Mars' Gene Hunt, but because it allows Miller to address Holmes's recovery by helping someone else, rather than struggling himself. This dynamic succeeds partly on the basis of Elementary's biggest strength, its cast and focus on building characters. Each interaction between Miller and Liu works perfectly as well, and the clever dialogue maintains the dark yet grounded atmosphere the first season established. Miller and Liu's performances get even better when they deal with Mycroft Holmes. Played with dry exasperation by Rhys Ifans, Mycroft is a wonderful source of conflict and insight into Miller's more manic Sherlock. The rapport between the two is great. The show's take on the Holmes brothers could have easily devolved into a cliché bit of sibling bickering, but manages to be witty and sharp. Sherlock’s repeated insult of “Fatty” to Mycroft is followed up with disapproval for being lazy and—shockingly—a restaurateur. Mycroft gets his share of pithy retorts, but his best doesn’t require words. It instead comes in the form of a nice homemade explosive that shows both Holmes brothers are unlike anyone else. There is one element from Doyle's canonical take on Mycroft's employment—one that that fans of the Ritchie and BBC Holmes adaptations will immediately think of—that is ignored in the episode. It's not disregarded, but it will be interesting to see if Elementary's showrunners decide to use it at all, or are simply saving it for a later story. For much of Elementary's first season, the writers focused on a number of elements from Doyle's tales that other adaptations did not address. Holmes's drug use, his beekeeping, the character of Captain Gregson—these ideas were executed very well, and added both complexity and fun to the show, but they felt at times like conscious efforts to differentiate Elementary from the Ritchie films and Sherlock. This time, the introduction of more elements from the canon seems to show a bit of confidence from the writers, and it does help to make Elementary distinct from its more generic peers. Now the big mystery for the rest of the season: Can the rest of the season hold up? Nicholas Slayton is a former producer for TheAtlantic.com.